An aerial view of Broad Street Station near the current location of15th and John F. Kennedy Blvd. It was once one of the most important and largest train stations in the nation. Now it's a distant memory, with only a historic marker and a few artifacts to prove this building located at Broad and Market Streets ever existed. Broad Street Station was home to the Pennsylvania Railroad when trains were king. Built in 1882, it needed to be expanded only a few years later. Philadelphia's leading architect, Frank Furness, designed the 10-story office tower and station of brick with terra cotta ornament, featuring a 306-ft. by 600-ft. train shed that eventually covered 16 tracks (which was later destroyed in a 1923 fire). A Philadelphia native and graduate of the University of Pennsylvania, Furness (1839-1912) received a Medal of Honor for bravery during the Civil War. Many Philadelphia's major corporations and banks commissioned him to design their buildings. He designed more than 600 structures, many in the Philadelphia region. 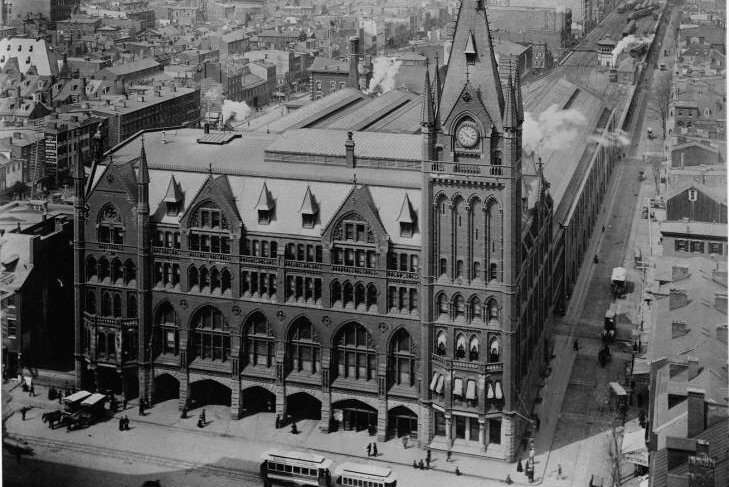 Changing times, tastes and other factors, however, doomed the station: it occupied premium real estate, and city fathers decided to replace it, along with its two-story, nine-block viaduct, with 30th Street Station. The Great Depression and World War II postponed its demise until 1952-53, when crews began tearing it down and replaced with the gleaming office towers at Penn Center. An estimated 30,000 truck loads of the station's rubble were transported to help lay the foundation for a pier in South Philadelphia. There are several artifacts from the station at the architectural archives. While a 50-foot sculpture on the station's exterior by artist Karl Bitter was destroyed, Penn has the model Bitter created. His concept depicted allegoric figures harnessing fire and water for service to mankind. People can view this and other items, such as drawings, at the architectural archives by appointment. The Railroad Museum of Pennsylvania in Lancaster County has an exhibit on the station. On loan from a private collector is a stained glass window from the main waiting room. The clock from Broad Street Station's tower is on the museum's exterior and is in working order. But Broad Street Station had flaws. Among them the need for long-distance trains to back out of the station, adding up to 45 minutes to several routes; and the viaduct hindering development north of Market Street. Whitaker says Furness was considered idiosyncratic, even a renegade towards design. But in trying to establish their own identity, he said the next generation of architects went in a different direction. Many of Furness' buildings have been torn down, “but he was not a marginal player, this was a central figure in our thinking,” said Whitaker. 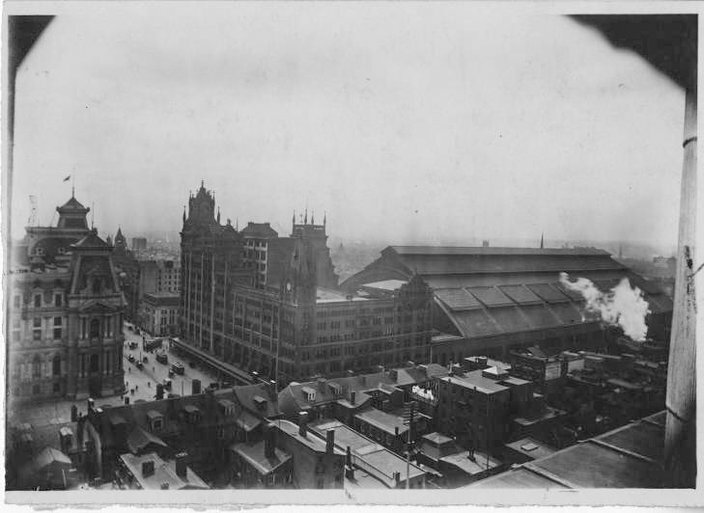 The view over rooftops of Broad Street Station as it appeared in 1901. The buildings in the foreground are in the current location of the Municipal Services Building at 15th and John F. Kennedy Blvd. Among his surviving works are the Pennsylvania Academy of Fine Arts, the Anne and Jerome Fisher Fine Arts Library at Penn (formerly the University's main library); and the First Unitarian Church of Philadelphia at 2125 Chestnut Street. More than the building and its artwork have vanished, says Whitaker. 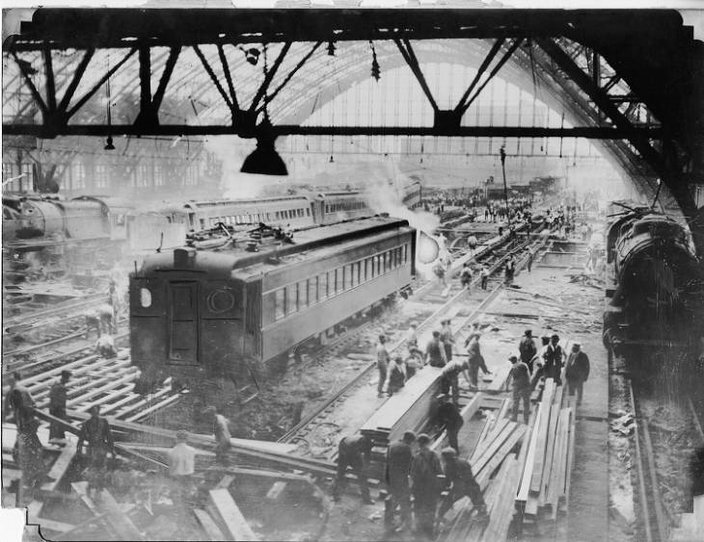 The station represented a time and place when the city was a leading force in America's industrial and economic might. “We've lost a connection to that,” he said. 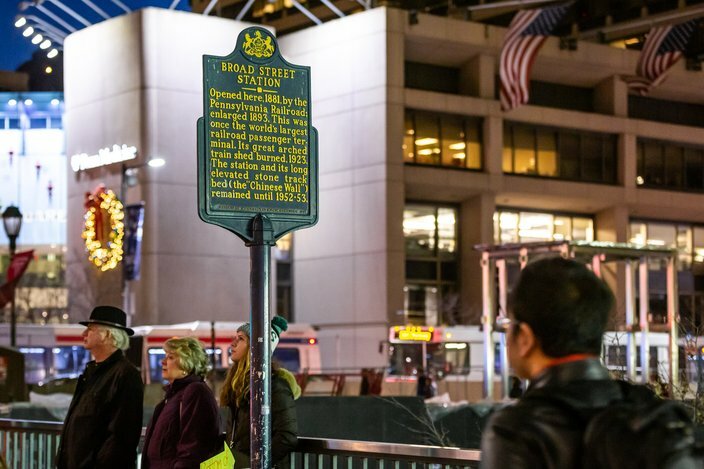 A Pennsylvania state historical marker on the Northwest corner of 15th and Market streets in the former location of Broad Street Station. An estimated 30,000 truck loads of the station's rubble were transported to help lay the foundation for a pier in South Philadelphia. Theodore Xaras, an artist who teaches portrait painting at the Pennsylvania Academy and is familiar with the materials used in the station, said, “theoretically it would possible to unearth the broken pieces as architectural salvage, and among the debris you might find the rest of the Karl Bitter sculptures. It would take a monumental archaeological dig to do that. "But remember, that is exactly how many historical sites from the ancient world were excavated and in some cases, reconstructed."